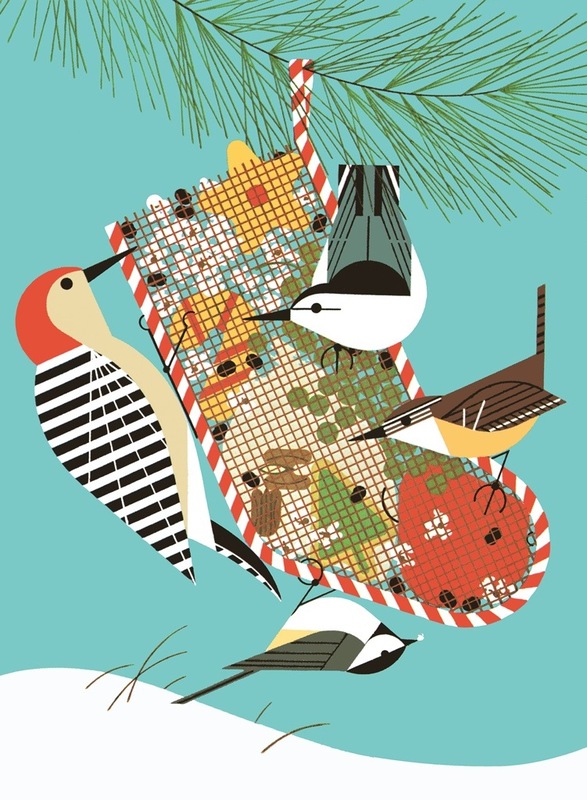 Charley Harper was a genius of a graphic artist. His cheerful, highly-stylised wildlife prints always make me smile inside. So I was very happy to find his festive “Backyard Birds” print on Christmas cards when I went to New York earlier this month. I had to have them! It’s a crisp and wholly fantastic scene, with jazzily interpreted birds feasting on a festive stocking filled with tasty treats. So much prettier than reality, but beautifully balanced and full of joy. Fishs Eddy on Broadway have collaborated with Todd Oldham to create a range of tableware featuring an assortment of Harper’s quirky bird and fish designs. To add to my extensive plate collection (sad, I know), I bought one with this striking cardinal on it. Not very English, but I love it. No snow for us in the south this festive season, but I hope these chirpy images amuse you as much as they do me. Have a wonderful Christmas everyone, may yours be merry and bright!